From his days with DC Talk to the present, many consider Tobymac the Godfather of Christian hip hop. His solo career started in 2001 and he hasn’t slowed down, releasing six studio records after a long and successful career with DC Talk. 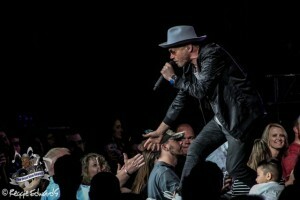 To have two careers as successful as Tobymac is a testament to his dedication, talent and drive. Every year or two, Tobymac brings his Hits Deep Tour on the road, featuring some of the biggest rising artists in CCM at the time and this year is no exception as he was joined by Mac Powell of Third Day, Ryan Stevenson, Mandisa, Capital Kings, Hollyn and Matt Maher and the tour wrapped up at Indianapolis’ Bankers Life Fieldhouse for an evening that lived up to every bit of expectations. The night started early with newcomer Hollyn, who’s been making noise lately as one of Tobymac’s most recent signees to the Gotee label. Her mix of hip hop, acoustic and rock music had a little something for everyone and she knew exactly how to get everyone going. It’s just a shame she only had a three-song set to work with but she made the most of it. Next up were Capital Kings who took the energy left by Hollyn and cranked it up even higher. They have more of a dance club/EDM sound but it was a perfect balance and they even brought Hollyn out for a song too. Jumping off their LED turntable booth and bringing smoke effects and lasers into the mix, the crowd couldn’t help but get into it. Mac Powell of Third Day came on next and blew everyone away even more. A lot of people expected a typical CCM set or a set loaded with Third Day songs but that couldn’t have been further from what Powell actually did. Aside from “God of Wonders,” he played a set full of country and bluegrass tracks and had the crowd jumping and dancing with each song. He even took a moment to announce the title of the upcoming Third Day record- Revival– look for it this Fall. Mandisa took things to another level with a set full of R&B and dance-infused Gospel songs that had everyone dancing even more than they had earlier. She took a moment to talk about some of her personal struggles and spoke about how God and her faith had helped her overcome but that it’s still a daily battle, which the crowd got behind pretty quickly. Not long after Mandisa wrapped things up, Matt Maher took the stage for a praise and worship experience that you had to be there for to truly understand and appreciate. Sometimes you don’t need all the loud and heavy music to make a set and song powerful and Maher has mastered this approach. His set was as intense as any other musician and was one you’ll gladly watch more than once. Not long after, a curtain covered the stage and Tobymac started in with his set. Kicking things off with “Like a Match” was an interesting choice but it worked perfectly. His set was loaded with hit upon hit- all from recent records, though. With a record as successful as his most recent This Is Not A Test, you could expect a decent amount of material and with as big as his last two or three albums have been, you can almost expect no material from his first album or two when you see him live now. 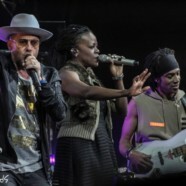 On this tour, though, Toby included two tracks from his sophomore record, Welcome to Diverse City– “Fresher than a Night at the W” and “Catchafire,” which made the longtime fans very happy. Overall, the setlist was very balanced and had a little something for everyone. Then add the energy, intensity and adrenaline that comes from a Tobymac show and lived up to every expectation possible. With a tour like Hits Deep, you can’t go in expecting anything new- maybe a new setlist but no new material. There won’t be a lot of talking but there will be a lot of music, which is exactly what we got, sending everyone home ready for another go-around.